It has been a field of research that has been gathering pace for a number of years, but as the demand for wearable tech becomes even greater, smart clothing appears to be where the future is headed. Wearable technology, like activity trackers and smart watches, is fast becoming a staple part of everyday outfits. Monitoring our own health and movement is now possible at the touch of a screen. 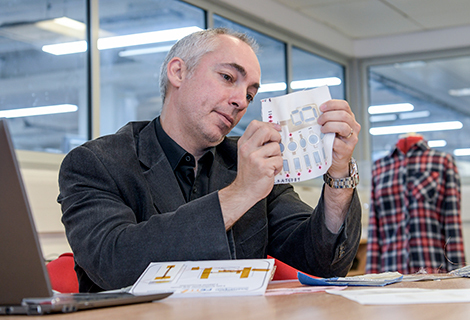 Actually embedding the technology into the material itself, known as smart fabrics or e-textiles, is the next step and this has been a leading research area at Southampton for many years. Developing ways for a circuit to be powered through energy harvesting – capturing energy through external sources like kinetic or solar and then storing it to power devices – has been a key focus. Our scientists are even developing ways for us to power the devices we wear ourselves through every-day movements, and are also working to introduce wearable technology in the healthcare sector. Leading this research within Electronics and Computer Science is Professor Steve Beeby, Head of the Smart Electronic Materials and Systems research group. He explains: “Sensors, for example in an activity tracker like a Fitbit, are all very small. We are trying to develop to a format where we can package it into a textile. "Capturing just ambient light for example requires photo voltaic technology but obviously you can’t have rigid solar panels on your clothes so we are trying to make the textile itself photo voltaic." A significant challenge for researchers has been trying to harvest enough energy to power these tiny wearable circuits. “The issue has been powering the wearable. Capturing just ambient light, for example, requires photo voltaic technology, but obviously you can’t have rigid solar panels on your clothes so we are trying to make the textile itself photo voltaic,” says Steve. Cutting edge research into harvesting kinetic energy is also taking place in our industry-standard cleanroom laboratories. Mobile phone companies have been investing in research to see whether a device could be charged from a person’s own movement and have tested the idea at festivals where movement is increased. Harvesting mechanical energy from the movement of the textile is even more challenging because the fabric by its very nature is designed to be compliant. Its ability to bend and move with the person wearing it means it is not ideal for capturing the energy needed. So while wearable device charging would rely on a huge change in direction by phone manufacturers for it to work – from functionality to efficiency – smaller, less powerful devices are very much within sight for practical application. Steve and his team have been working on using smart materials in shoes to power wearable technology. He says: “We are looking at converting shoe insoles that act both as a sensor and an energy harvester. This has been developed to act as a self-powered pedometer, power transmissions for indoor localisation and potentially monitor foot pressure and distribution. We are looking at having this technology in peoples’ homes so that we can detect activity and that can be incredible useful information for doctors to have in terms of monitoring rehabilitation or to see, for example, the progression of diseases such as Parkinson’s. Working in partnership with other universities, businesses and through spin-out companies of our own, the University is forging forward with the practical application of the technology, particularly in the healthcare sector. In a project being led by Bristol University, Steve and his team are currently involved in developing wearable technology that can be used to monitor patients in their own home, providing data that can then be assessed by medics without the need for a face-to-face consultation – a field known as ambient assisted living. The tech could also be used to assess disease progression by monitoring movement. Steve explains: “The issue with monitoring patients in their own home using a watch-type device or wrist strap is one of compliance. If it doesn’t offer any functionality for the wearer they are less likely to put it on and we know that has an impact on compliance rates. If the tech was in their clothes that they are wearing anyway, it is monitoring them without them even knowing it. “We are looking at having this technology in peoples’ homes so that we can detect activity and that can be incredibly useful information for doctors to have in terms of monitoring rehabilitation or to see, for example, the progression of diseases such as Parkinson’s. The same technology can be used in architecture to create ‘smart buildings’. We are already seeing examples of how buildings ‘react’ the number of people inside them and the type of activity they are doing by providing the right amount of air conditioning or heating. How the technology will be used in other fields remains to be seen, but Southampton will continue to be at the forefront of wearable technology development. Steve adds: “I would say that the UK are leading in the e-textiles domain and Southampton is at the forefront of that when it comes to integrating true electronic functionality into textiles with sensors and investigating the reliability of it.